Ensuring the privacy of your customers’ personal data is now a key component of your digital-business success. 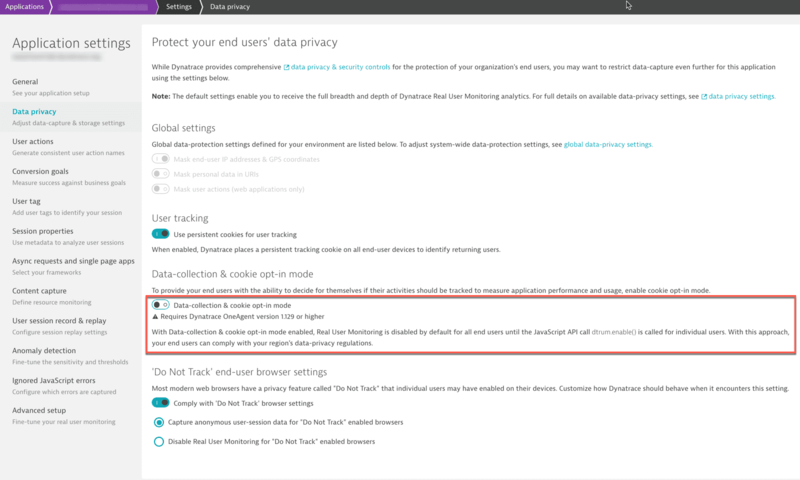 Dynatrace provides numerous privacy enhancements that make it easy for you to configure appropriate settings that protect your customers personal data and ensure your organization’s compliance with GDPR. Note: For details on privacy settings that are configured globally, environment-wide, please see How do I configure global privacy settings? Data privacy settings available for web applications make it easy to implement data-privacy standards at the application level. To provide you with an easy overview of all applicable privacy settings, the Global settings section at the top of the settings page reflects the same environment-wide privacy settings that are configurable at Settings > Preferences > Data privacy. Details of the other privacy settings that are available for web applications are detailed in the following sections. Note: User tracking is disabled by default for all newly created applications. Settings for existing applications aren’t affected and so must be configured manually. Note: Opt-in mode isn’t enabled by default. Another technique for protecting end-user privacy that’s supported by all web browsers is the Do Not Track HTTP header. With this setting enabled, browsers add an additional HTTP request header to all the web requests they send. This header specifies that all user tracking must be disabled. (Enabled by default) Captures user sessions from the browser, but excludes all personal information that could lead to the identification of the user. The IP address is masked and no user tag information is sent. 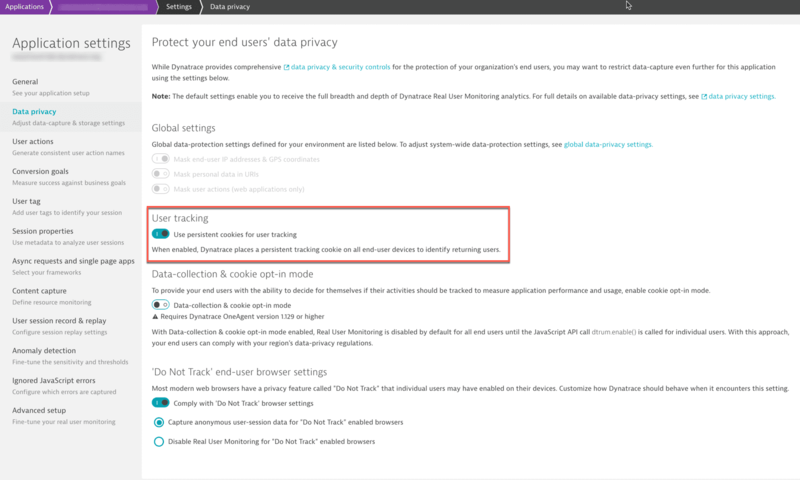 Note: With the User tracking setting enabled (see above), Dynatrace still sets a persistent cookie to detect returning browsers. 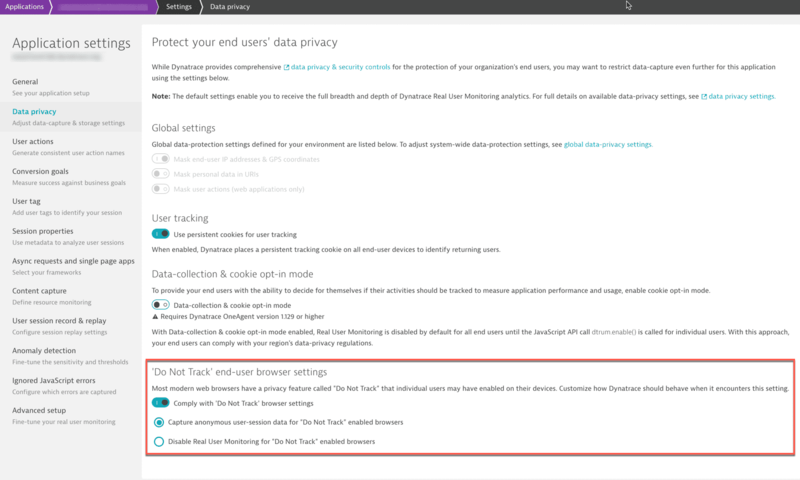 (Disabled by default) No data is captured from browsers that have the “Do Not Track” setting enabled. Note: The Respect browsers’ Do Not Track setting is enabled by default for both new and existing applications. 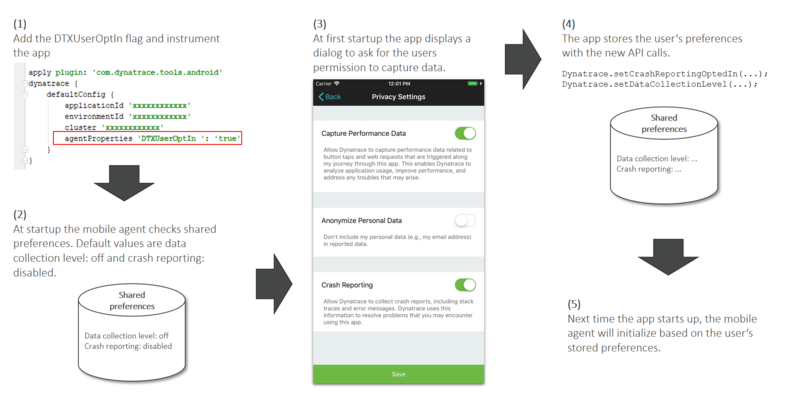 To ensure that your mobile apps are compliant with GDPR (or the Google prominent disclosure requirement) you must secure your end user’s permission to capture their personal data and receive crash reports from their mobile devices. Starting with OneAgent for Mobile 7.1.4, there is a setting called User opt-in mode that allows you to implement such behavior. This allows you to control the monitoring data that are captured and whether or not crash reports should be sent on a per-user basis. off: No data is captured. user behavior: Both performance and user data is collected. In this mode, OneAgent recognizes and reports on users who re-visit your app in future sessions. Go to Settings > Monitoring > Monitoring overview and click the Applications tab. Select the desired application, click the browse [...] button, and select Edit. 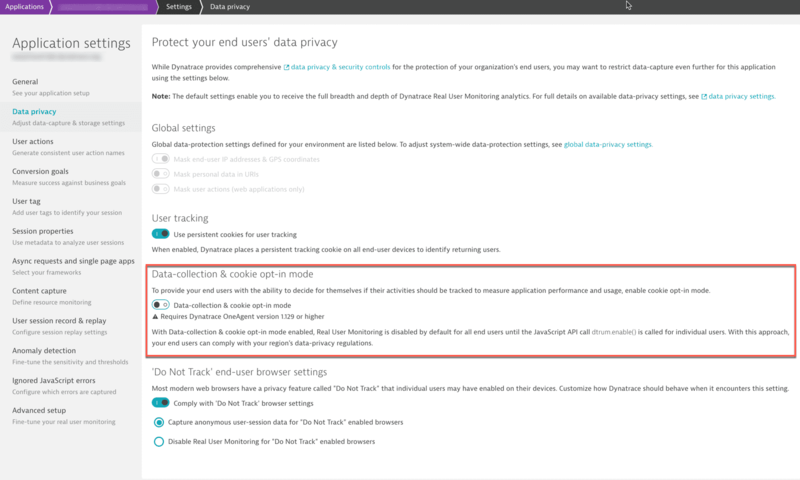 From the left navigation menu, select Data Privacy and turn on Data-collection & cookie opt-in mode.